Look closely: the wreath is a tromboncino squash, the last of our pickings from Derwood. We promise many posts this year on growing and eating cucurbits, including squash, melons, cucumbers and all their relatives! Happy New Year! 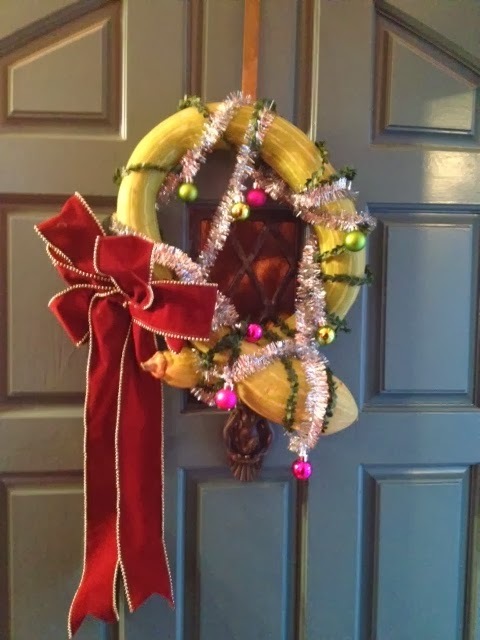 Maybe this beautiful wreath will start a whole new trend in “sustainable” holiday decorations. Grow it … hang it … eat it! Well, probably not the “eat it” part at the end, unfortunately – Robin did say it's getting a bit moldy now (and also frozen, I imagine).